The B+S Noodle/Pasta Cookers are available in two ranges - VERRO and B+S Black. Both are constructed using AISI 304 grade stainless steel and have a 2mm thick AISI 316 marine grade tank. The VERRO and B+S Black Noodle/Pasta Cooker have been designed with greater flexibility, quality and performance allowing them to meet the changing demands of a busy kitchen. These units can be used for noodles, pasta, soup warming, cheung fun rice pastry steaming and yum-cha dumpling steamer. The VERRO Noodle/Pasta cooker comes with a 24 month warranty and the B+S Black Pasta/Noodle Cooker comes with an 18 month warranty. For more information or to view the brochure for this product, click on the products below. The VERRO premium fusion series pasta cooker delivers the best in quality, performance and flexibility. 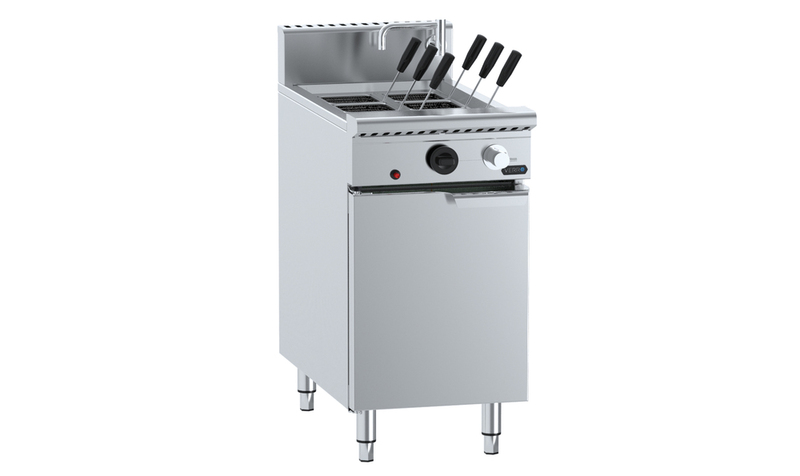 This unit is constructed from AISI 304 grade stainless steel and features a heavy-duty 2mm thick AISI 316 grade stainless steel tank. Thank you for your enquiry. Our team will be in touch shortly, if there is anything we can do to help or if the matter is urgent please email us at info@bscommercialkitchens.com.